Sometime in 2017 I had a suggested group appear on Facebook. I'm not normally one to pay that much attention to them but this one caught my eye. It was titled "Toowoomba and District Sewing Group". This caught my attention and I immediately requested to join. I have never regretted that decision. I attended the first sewing meet they held in the middle of 2017 and I honestly believe it was one of the best decisions on my life. From that day I made some amazing friends and I am always thankful that I put any nervousness aside and went that day. I mean you're always told not to meet strangers from the internet but I have no regrets. The sewing days run every second month and are a great way to turn what is normally a solo hobby into something much more social. So when someone suggested that we have a sewing retreat and spend three whole days sewing I couldn't say no. I went to retreat prepared, more projects than I could possibly complete in three days, especially with chatting but better to be safe than sorry. I'm pleased to report that I actually got three projects completed at retreat. Two fairly significant ones too. 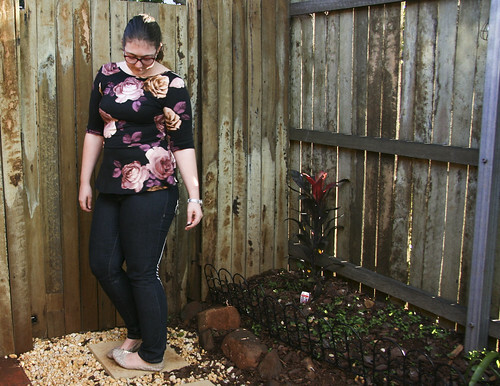 - A Papercut Patterns Bellatrix Blazer using Outback Wife Barkcloth. Anyway a bit more bout what I actually made. I'm perpetually late and joining the bandwagon and am almost ashamed to admit I only made my first Ogden Cami at the end of last year. This was my second and was made using a cotton/silk remnant from The Fabric Store (1.3mx1.1m for those wondering). I'm totally in love with how it turned out. I wear it frequently and have a number of others planned. The next project I made was a pair of Ginger Jeans, this was my fifth pair so I'm pretty confident with the fit and process now. 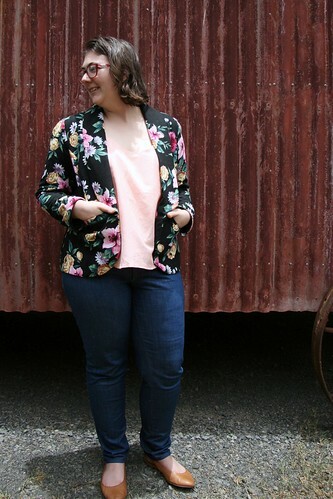 I used a Cone Mills S-Gene Denim I got from Blackbird Fabrics a year ago. I purchased 2.5m and managed to get 2 pairs out of it! I'm still not sure how. I lined the waistband (and pockets) with a different fabric but I'm maintaining two pairs out of that amount of fabric is impressive - especially considering the fabric requirements for my size are 1.8-2m! This photo also shows how cute the back of the Ogden is. I love this pattern. 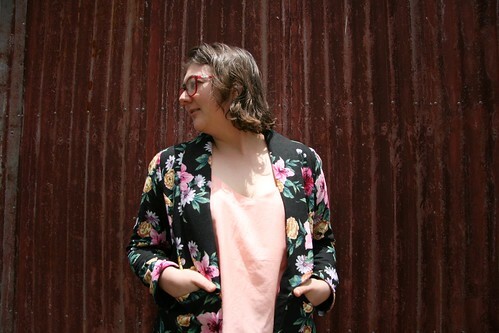 The other project I made at retreat was a Papercut Patterns Bellatrix Blazer. I'd purchased some Outback Wife Barkcloth from East Coast Fabrics to make a jacket. 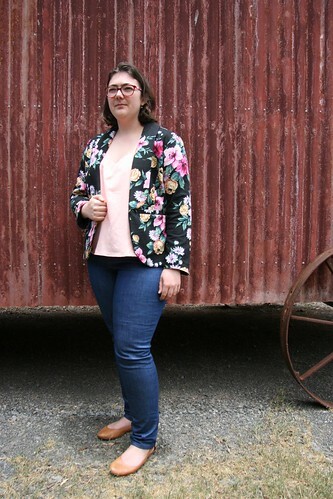 I'd originally thought about a jacket similar to the ones that Anna from Owns It by Anna sells, however the Brisbane Spoolettes encouraged me to try it with the Bellatrix Blazer and I'm so glad I did. As normal I had bicep issues. Not with mine, the pattern. I really need to do a full bicep adjustment but it scares me so I did the same wedge trick that I did on my last Morris (Which I thought I'd blogged but apparently not!). Not technically correct but it works. A full bicep adjustment is on my list for the next one though. Anyway, I'm still having withdrawals from this fantastic weekend. We've planned next years already. I'm trying to get into the habit of blogging more frequently, aiming for once a month for 2019, 2/2 so far, but only just. Also, total side note, The Fabric Store is my new local fabric shop and it is proving very very dangerous for my wallet and stash! On the plus side my wardrobe is looking amazing! I've been to Spotlight three times since I moved, twice for interfacing and once for buttons. I think my record for The Fabric Store is three visits in a week. I find that what I sew tends to come from a number of different places. Sometimes it start with a pattern, others its a fabric and other times a finished garment, either RTW or from another maker. This outfit came from a few different places, and never intended to end up together but I'm completely in love with them together. A friend of mine asked me to help her make an outfit for a 70's Palm Springs themed Christmas party. Some time on Pinterest made me fall totally in love with the idea of wide leg linen pants. 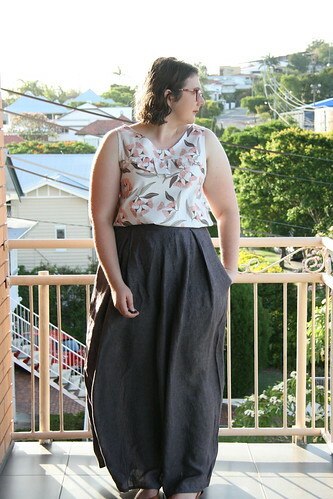 This of course led me to the Winslow Culottes by Helen's Closet which were already in my pattern collection. A quick trip to The Fabric Store and I knew I needed a pair for myself too. I made these using a mid weight charcoal linen. They read charcoal but do have a very purple look up close. The linen was lovely to work with and really lends itself to these type of pants. I made View D for full length pants and have plans for some shorter ones too. The only change I made to the pattern was swapping the straight waistband out for a curved one. I've worked out a curved waistband really helps with keeping things in place on my body so its a change I made to most patterns now. 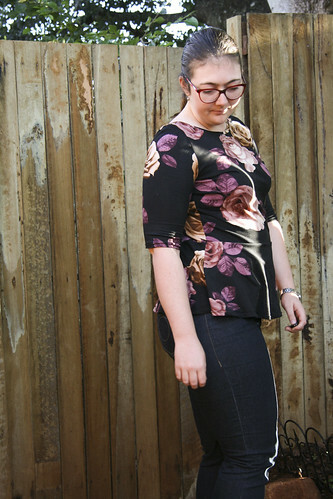 This top is a total recreation of this top by Katie of Katie Makes a Dress. She really makes the coolest things. She used a self drafted pattern for hers which bought me to what I ended up with. One of my goals for this year is to purchase less. This involves hacking and altering patterns I already have, where possible, to achieve the look I want. Thankfully it turned out well in this case. 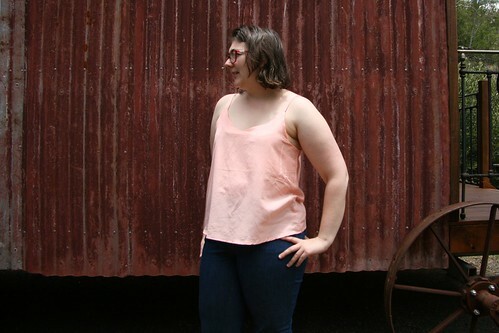 I started using the Sew Over It Silk Cami pattern as a base. I've made this pattern before and know it fits well if I don't do french seams. Using the smaller seam allowance makes all the difference for me with this pattern. 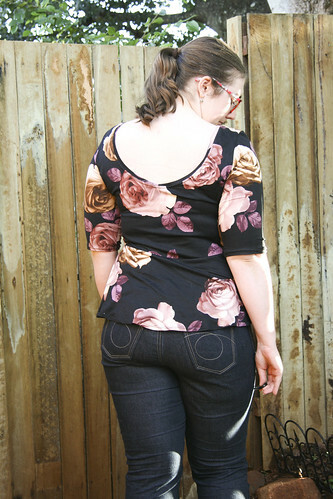 The changes I made included raising the front neckline about 2 inches and lowering the back neckline by about the same. I didn't refraft the facings and used bias binding on the neck and arm holes. To insert the frill I used my french curve to create a subtle curve just above the bust where I cut the pattern and added seam allowance. I then drafted a slightly curved piece which I gathered and inserted. It was a pretty simple alteration and worked out pretty well for a first attempt! 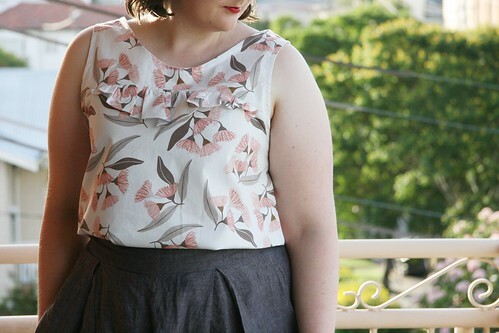 I purchased fabric for this top about 6 months ago with my work bonus. I treated myself to an order from Nerida Hansen. This Jocelyn Proust print is amazing and I'm so glad I managed to add it to my stash. It's a 100% cotton base which worked really well for this project. I'm really glad I cut into it. I understand the temptation to leave things stashed for good but I've worked out that as my tastes are ever changing it's much better to just sew the fabric while I like it! Also, rookie error was doing my make up, including red lip stick before getting dressed. That may have been the riskiest thing about this whole outfit! I'm not going to lie when I say this make is a shameless copy and my friend, Beth, and I will now need to coordinate outfits to make sure we don't match. She posted this Hope in Black Double Brushed Polyester from Lush Fabrics in her feed and I knew I had to have it. If iI remember correctly I snagged one of the last bits they had in stock at the time. Beth had made a Miss Ruby Tuesday Dress by 1 Puddle Lane from her fabric and I loved the shape of the bodice. I'm not much of a dress wearer though, but as a sucker for a good peplum I knew that was just what I needed to make from this fabric. I used the boat neck and scoop back for my top. The beauty of the MRT pattern is the sheer number of views which are included and the ability to mix and match them to create so many different garments from one pattern. Talk about value for money. One think worth noting is that it is drafted for quite a short height. I had to add two inches of length. I initially added 2.5 inches which was too much and then I promptly reduced it back to 2 inches. Being a knit pattern it was a quick sew and something which is often pulled out of my wardrobe when I need something a bit dressier than a tshirt. If you've been following me for a while you would know that before I seriously started sewing my own clothes, I started bra making. Talk about doing things backwards. My love for Orange Lingerie's Boylston Bra is well known. It is my favourite bra pattern, it just fits so well and I adore the shape, and the straps. I'm a sucker for a good fabric strap. Anyway, it's been quite a while since I've made any bras and I was well overdue to get some new ones in my wardrobe. I had some floral scuba fabric left over from some leggings and decided that it would be perfect for a new bra. I'm pleased to day I wasn't wrong. I initially intended to make this bra without a foam lining and using 50 denier lining. For some reason I found this pretty impossible and my fabric kept stretching which resulted in puckering and all kinds of bad things, I became very, very good friends with my seam ripper before deciding in the end to just cut new pieces and use cut and sew foam for the lining. I used navy powermesh for the back. Powermesh is such an important material in the bra making process because it has the recover and gives the support which is required in order to have a well fitting bra. I used back cut and sew foam and elastics as it was what I had on hand. I contemplated ordering navy but I'm trying hard to sew through my stash this year and I actually really like the way the black works with it. i also used rose gold rings and sliders and added a double ring detail which may prove annoying. Time will tell I guess. I'm a sucker for a good floral and I'm so glad I decided to use up the scraps I had to make this bra. That is the beauty of bra making, that even scraps which wouldn't be considered useable in other cases can often come together to from a fantastic bra. Of course what is the point of making a new bra if you don't turn it into a matching set? I'm a massive fan of the Tuesday Boyshort from Emerald Erin. My most regularly worn underwear uses this pattern. I can't recommend it enough. 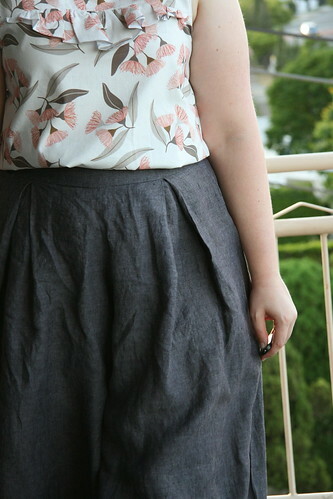 I hacked the pattern sightly to include some of the floral fabric in it. It just ties it together a little bit in my opinion. I also overlocked the elastics on and then enclosed them. 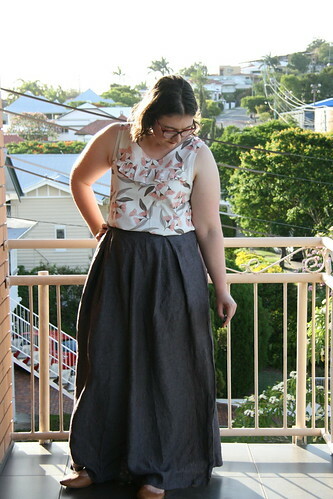 I should have changed my overlocker thread but I honestly just didn't feel like it. I'm a bit of a rebel like that. I'm sure this set will get tonnes of wear. There's nothing quite like a new matching set of handmade underwear to make you smile every time you put it on. 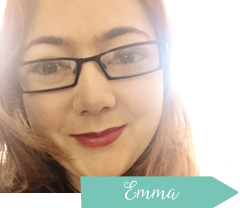 Copyright Emma Meiklejohn 2015. Powered by Blogger.